A sleek design Oak candle holder, showing simplistic and featured lines. The hand made Oak Cheese Board is designed with sleek chamfered edges and curved ends. A piece that the entire family of cheese lovers can use and enjoy. The piece is as functional as the natural attraction of the wood's appearance. Hand planing flat and square the split edge in preparation for assembly. Original condition with a large split, caused by being placed next to a fireplace in a pub. Fully restored with the large split cut out and the table French polished to revive the original surface finish. Maple wood office desk constructed with hand cut dovetail rails to create greater strength and to show my quality of craftsmanship. Cherry wood occasional side table is designed with smooth and elegant flowing curves to soften the piece's appearance. Oak dining chair is upholstered with Olive Green suede. It has exposed mortise and tenon joints on side rails to create greater strength and show my quality of craftsmanship..
Based in Watford Hertfordshire in my wood workshop, I design and make free standing bespoke furniture out of solid wood for client's commission to enhance and personalise your home and working space. Each piece of furniture is made to your required measurement's and your design preference. I restore modern and antique furniture to the client's specification on commission whether your piece needs the joints to be repaired, new components need to be made or the piece needs to be stripped back and re polished with modern finishes or French polished. Working with client's within Watford Hertfordshire, Bushey, Rickmansworth, Chorleywood, Croxley Green, Saint Albans and surrounding areas. The Cherry wood occasional side table is created with smooth and elegantly flowing lines, which fluently allows the natural light to pass through and around it's subtle curves as part of its design. The Display stand is constructed from Oak, Maple and Cherry strips which are individually sized to create a variation in design. 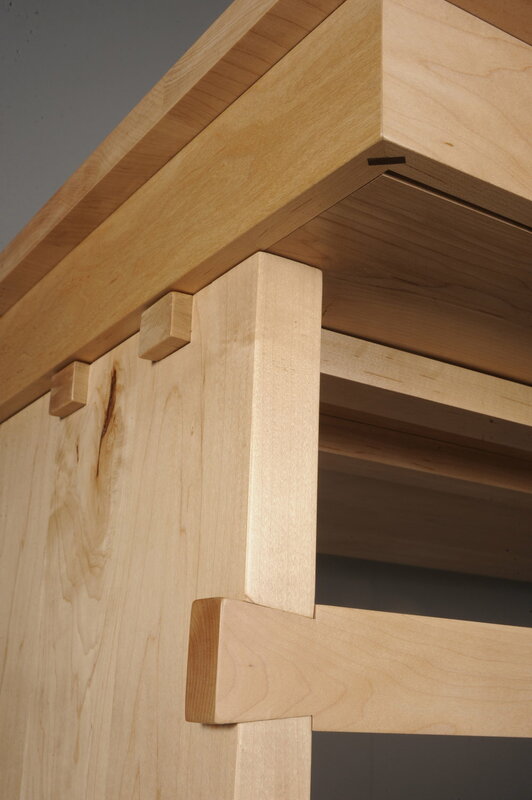 Oak feet are used to raise the surface to enhance the piece that is displayed on it. The Tulip side table is jointed with mortise and tenon joints which are exposed to show the attention to detail and quality of my craftsmanship. Each of the two brackets are hand made from Tulip wood. This "much-loved" Oak Drop Leaf Dining Table was commissioned for the overall size of the table to be altered and minimised. This was to enhance the functionality of the piece giving a smaller proportion and plenty of space to move around. The edges were then re-polished to match the original colour. The table was firstly measured and cut to the given size. The newly exposed edge were then sanded and shaped smoothly to the original shape of the cut off edges. A matching finish was then applied to the edges to blend in with the existing appearance of the table as if it had not been altered. 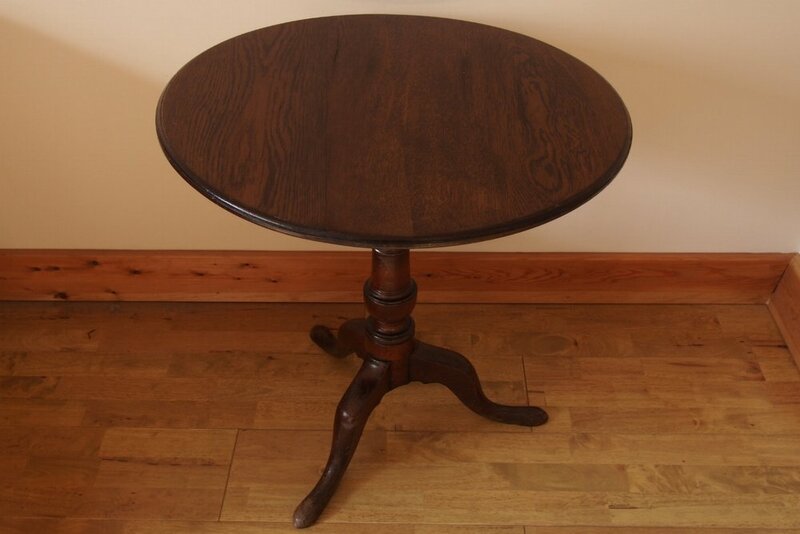 The Oak Drop Leaf table when opened had taken up a lot of room in the clients dining room. The request was to cut the diameter of the table to a smaller size and to replicate the newly exposed edges to match the original edges of the table. The Modern Oak Dining table was finished with a clear protective finish to bring out the natural beauty of the wood’s appearance. A clear wax was then applied to further protect the surface of the table. The Modern Oak Dining Table had been bleached to a orange and yellow apperance due to the sun’s natural uv rays. The table required removing the surface finish and also to remove the surface scratches. This sentimental Captain's Chair was commissioned to be restored and repaired to the given specification. The chair was to be stripped of its original finish and to have a light brown finish applied. One of the legs had fallen off that needed to be re-glued into position. Several existing thick layers of the original finish were stripped back and it was evident that all of the legs and lower rails were loose, therefore each of these component's needed to be re-positioned and glued. The entire chair was lightly de-nibbed in order to make each surface smooth in preparation for the light brown varnish to be applied. A recommended final coat of wax was applied to further protect the surface from wear and discolouration. The Captains Chair was presented with loose joints on the entire under frame. One leg was detached and the entire surface of the chair was coated with a thick and dark finish. The restoration and repair of this Card Table was to repair a loose and broken Lions claw castor. The Card Table was presented with a broken metal Lions Claw Castor. The claw was purely being held together with a single screw. The wood had broken off that inserts into the castor. The Danish 1920's Riva set of dining chairs made from Cherry wood, were presented with several loose joints and broken off components which required each chair to be reconstructed back to their original condition. Restoring the quality of the aesthetic's and durability meant that the client could one again enjoy their set of dining chair's with their family for many more years to come. All Five chairs were presented with loose joints and a few chairs had broken parts. My hopelessly damaged edwardian bureau with split, broken and missing timber around dysfunctional hinges, and sun ruined patina, was restored to original condition in look and practicality. Likewise, a five-tier edwardian Bookcase with forward-sliding and return leaded glass windows on wooden runners (looks simple but is not considering age and damage), most of which did not work, was restored to better functional condition then when I first acquired it more than 30 years ago. The patina on pieces, and a traditional dresser, were also restored to their best potential. Sam Ryan’s sympathetic approach to practical restoration I found affordable and worthy of highest recommendation. The Cherry wood writing desk has been treasured piece of the clients for many years. The piece had not been unusable of a long period of time. Until the client approached me to fully restored it back to a functional and aesthetically pleasing state, to be once again loved and placed in the living room where it can be used and looked at every day. Original condition of Cherry Wood Edwardian Bureau. Oak Five-Tear Edwardian Bookcase fully restored from being a dysfunctional Bookcase that was in separate parts and had missing components. The original condition of the Five-Tear Edwardian Bookcase was in sectioned pieces and had missing wooden parts that were made to replicate the missing and broken areas. The wooden grooves for runners inside the bookcase were made to fit the glass pains smoothly. A missing fixing on one of the window pains was replaced for it to be functional once again. The Oak Traditional Dresser was presented with a heavily marked and stained top surface, which needed to be stripped back and re polished to match the original colour. There were several knocks and bruised edges on the corners and bottom of the piece that needed attention and re polishing. Original condition of the Oak Traditional Dresser. Many marks, scratches and stains were evident. The entire surface was striped and then re polished to match the existing colour. The 1920’s Oak Day Bed was finished with a clear polish and protected with a wax finish. Four new solid brass castors were applied and a small split in the wood was glued close. The 1920’s Oak Day Bed was presented with a thick dark surface finish that required stripping. The request was to then apply a clear finish, to give the day bed a lighter appearance that fits into a modern home. One of the four castors was missing and three were worn. A small split was also evident on the left leg. 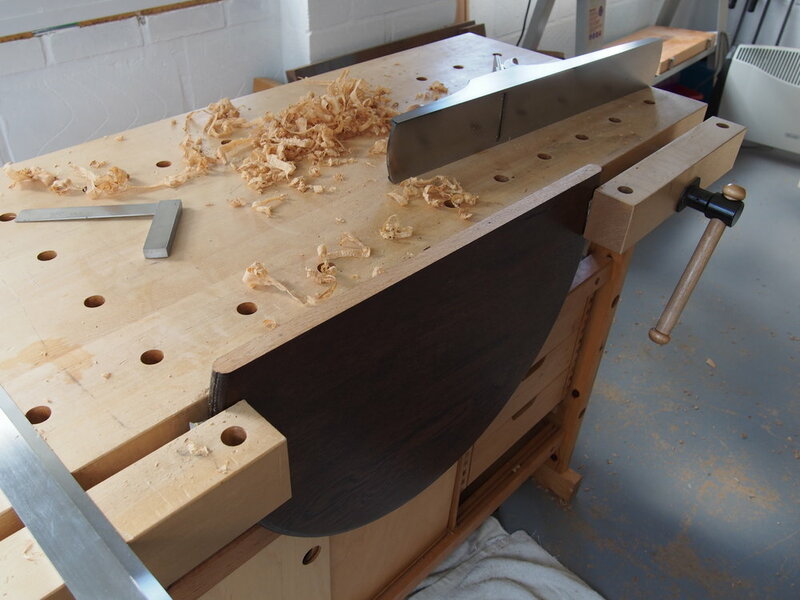 The Antique Walnut Desk was repaired with several edge lipping’s, around the top surface. The drawers were brought forwards and the broken drawer was repaired. The water marks, ink stains and scratches were removed and then the desk was re polished and protected with a wax finish. The Antique Walnut Desk was presented with several water marks, ink stains and scratches that needed to be removed. It was evident that several areas had broken and missing parts needed to be re made.